We regularly perform vettings for pre-purchase and insurance purposes in Surrey, Sussex and Kent as well as throughout the country at request. 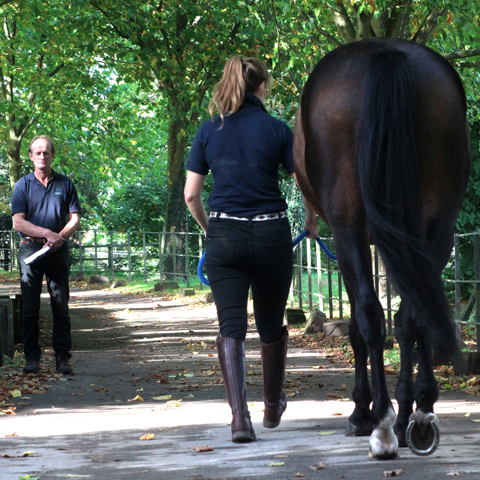 Our experienced vets at GVG Brooks equine will be able to carry out one of two types of vetting on behalf of our own clients and on behalf of non-registered clients. The five stage vetting is recommended for most horses, but particularly for horses that have previously been used for athletic purposes (riding, jumping, and driving). This examination is designed to identify any lameness or medical abnormalities that may render the horse or pony unsuitable for the prospective purchaser’s intended use. The limited two stage vetting is recommended for young and/or un-backed horses. This limited vetting consists of the first two stages of the full five stage vetting (outlined below) and will enable our vets to evaluate the horse or pony based on a restricted set of findings. Prior to the two stage examination the prospective purchaser will need to sign a “Limited Prior to Purchase Examination Form”, which confirms that you understand and accept that a limited examination may not reveal certain conditions which may have been discovered during the course of a full five stage vetting. The horse will have a complete physical examination at rest in the stable. The teeth will be checked to confirm the age documented in the passport, the presence of wolf teeth and for any major obvious dental abnormalities. An identification check of the horses markings will be made against the passport and the microchip will be scanned. The heart and lungs will be examined with a stethoscope and the musculoskeletal system will be examined by palpation. The skin of the horse will be examined and checked for any scars or lumps including melanomas and sarcoids. The feet will be examined for confirmation and any abnormalities. It is not a requirement of the pre-purchase exam to perform a detailed oral examination with a dental gag however most vets will perform a brief examination to check for any obvious major abnormalities. The eyes will be assessed in a darkened stable using an ophthalmoscope. This stage is designed as a preliminary soundness assessment of the horse. This includes examination of the horse at walk and trot in a straight line on a hard, level surface. 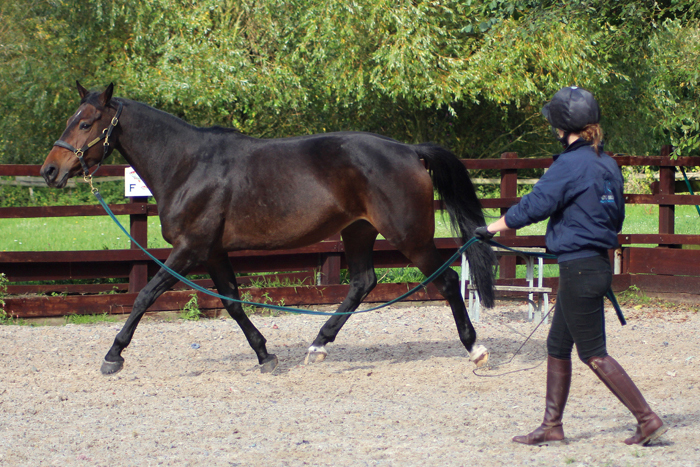 The horse will then be lunged on both reins on both a soft surface and a firm/hard surface. 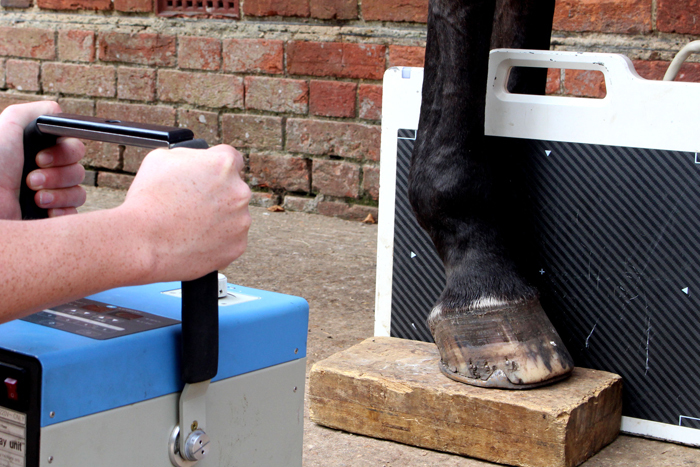 Flexion tests will also be performed in all four legs. 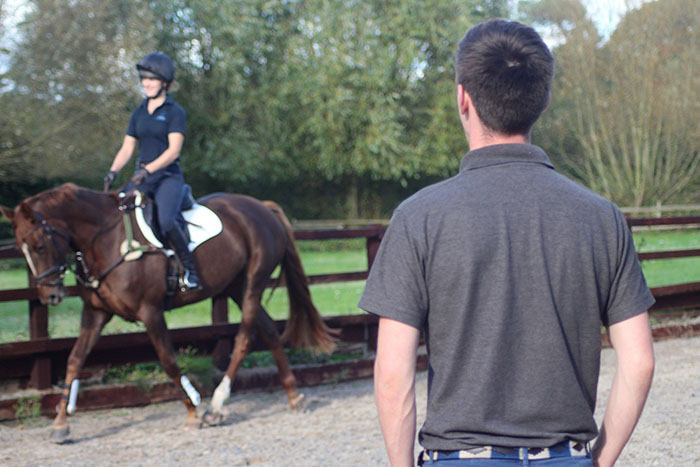 The horse will be required to walk, trot and canter under saddle. As the horse’s respiratory rate and effort increases the presence of any abnormal respiratory noises will be evaluated. The presence of any lameness will be evaluated throughout this phase and at the end of the ridden exercise the horse’s heart will be examined again with a stethoscope. The horse is returned to the stable and allowed time to recover from stage 3. The horse will also be observed for any behaviour such as crib biting, box walking or weaving. A second soundness examination of the horse will be performed in hand. 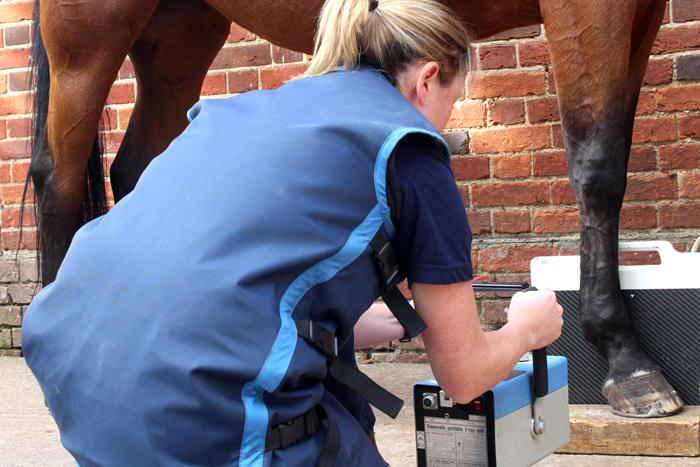 The purpose of this is to assess if the strenuous examination phase has exacerbated any subtle underlying lameness problems which may be present. Flexion tests and trotting on a small diameter circle may be repeated at this time. If the horse or pony is deemed suitable for purchase a blood sample will be taken after completion of the pre-purchase examination. The blood sample will be sent to a special national facility where it will be stored for six months. At the time of collecting the blood the vendor(seller) will sign a declaration to say that the horse has not been administered any drugs/medicines in the four week period prior to the vetting. A blood test can be requested at any point over the six month period to check for the presence of prohibited substances (drugs/medicines) which may have been in the horse/ponies system at the time of the pre-purchase examination. For prospective purchasers that request any further blood tests these can be taken at the same time as the standard blood sample (additional fee’s apply). For example: a full basic health screen blood test can be performed and/or a strangles antibody test. In many cases the vet performing the pre-purchase examination or the prospective insurance company may recommend or require radiographs (x-rays), ultrasound scans or an endoscopic examination of the lungs and throat. These may only be undertaken with the consent of the current owner and will incur an additional expense. We are happy to advise on the requirement of these more detailed diagnostic tests on an individual basis. 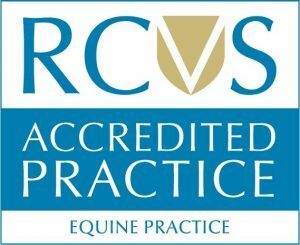 Following completion of the pre-purchase examination the vet will provide an opinion based on the balance of probabilities that any conditions identified will prejudice the horse or ponies suitability for its intended use, ie. whether or not the horse is suitable for purchase. A written pre-purchase examination certificate will also be provided which will include the details of any relevant clinical findings and/or history. Any abnormalities or relevant clinical history noted on the pre-purchase examination certificate must be disclosed to the horse or ponies insurance company at the time of taking out the policy. These can affect exclusions placed on insurance policies. Understandably, insurance companies will not usually provide insurance cover for a pre-existing condition. In the event that a horse or pony which is already in the possession of its owner requires an examination prior to taking out an insurance policy; a vetting for insurance purposes only can be completed. These examinations can be in the form of either the two stage or five stage examination, your insurance company will specify which. This procedure is the same as detailed above however it will not include the blood sample procedure and the vet will not give an opinion with regards to suitability for purchase.